In addition to personal names, we can add your logo under a polyurethane dome to make the DIVNICK Whole-In-One Adjustable a unique golf gift for executives, sales promotions, valuable clients and vendors, retirement gifts, and many other occasions. A Whole-In-One Adjustable with your logo will be a treasured gift that will continually remind the recipient of your appreciation for their value to your company. The following photos and descriptions are listed for your review. The NCR Corporation has given over 1,000 Divnick Adjustables to valuable employees, top-producing salespersons, and CEO's of many of the global companies they serve. Notice that a personal name can easily be included. Click here for a larger and more detailed view of this club. Voxwire, provider of online meeting rooms to the world, has given Whole-In-One's to their top executives and board members. Royal Caribbean gave clubs to 100 of their top-producing travel agents. On a travel agent cruise, when the agents returned to their cabin after an evening show, they discovered a Divnick Adjustable Golf Club on their pillow, with a beautiful Royal Caribbean logo! McDonnell Douglas Aircraft Company gave clubs to their valued vendor associates. Other companies give them as retirement gifts. Golf is a very popular gift and incentive category. Anyone can give away balls and tees, but the Whole-In-One is in a class by itself as a gift. Polyurethane dome technology is usually very expensive, requiring silk-screened logos for the image base. Liquid polyurethane is then poured over the silk-screen, and is cured in a vacuum chamber to provide a pure bubble-free lens-effect. It looks a lot like a bead of water on a freshly-polished car. But the cost is prohibitive and requires large quantities with minimum runs in the thousands. DivnickGolf has developed a proprietary process that allows us to make small quantities at very economical prices, even one at a time, with same or next business day turn around. Not every corporation will order 1,000 of them like NCR. Many will order only 1 or 2, or a dozen. We print in digital 4-color on waterproof photo-quality vinyl, then cover that with the polyurethane dome. It is permanently bonded into the oval cavity in the back of the head. It will never come out during use, even during extreme tempature changes and wet conditions. As you can see to the right, we make a lot of clubs for the military. See larger pictures of these clubs on our "Sponsor-a-Soldier" program. The one-time creative set up is $25 to $100, depending on how camera-ready it is when you send it to us. However, we waive this fee most of the time. We can even copy your logo from your website, although higher resolution makes a sharper logo. As you can see from the samples on this page, dark backgrounds look the best as they seem to "jump" out of the back of the club. A single Polydome with a corporate logo costs $25, with a $10 cost for each duplicate made in the same run, plus $1 for a personal name or line. We can usually make the Polydomes and ship in the same day, or the next day. Lead time for some quantities might take a little longer. Feel free to contact us to ask about the timing. If you want to send a .jpg or .pdf of your logo, please send it to sales@divnick.com. If you are interested in the logo option, please contact us by email or call us at 1-937-985-5863 (Eastern USA). Following are samples of some other polydome logos we have made. Click here to see an enlarged view of the Sieko-Franklin club in the lower left corner above which shows the extraordinary detail possible with a Polydome. As you can see in the line under the hands, these clubs were presented to special associates by name. Including a personal name makes the gift and logo even more impressive. 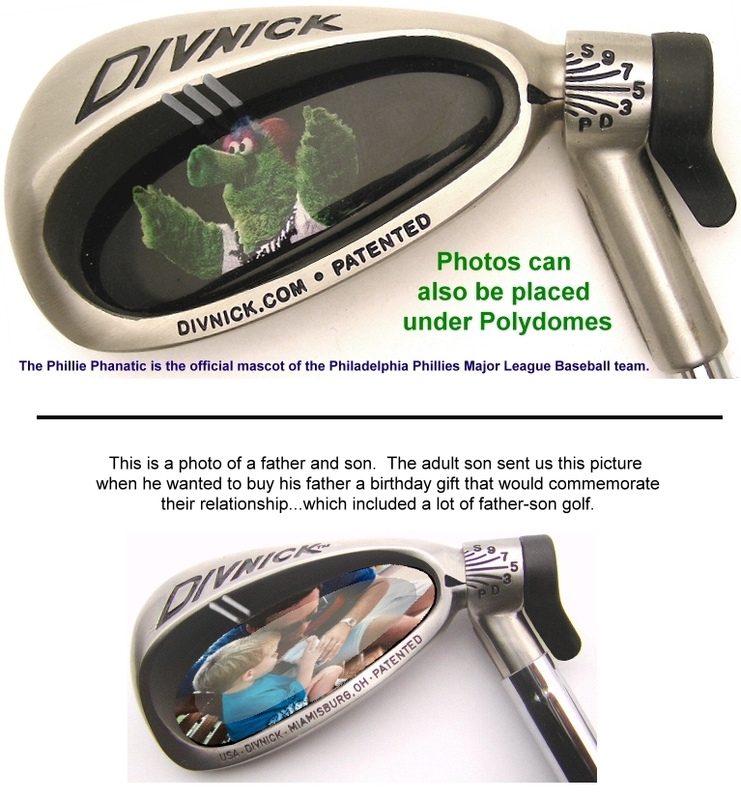 We can also use photos as shown in these pictures of the Philly Phanatic and a father and son. Click the picture to enlarge. Click here to see a printable PDF page of the above Polydomes if you want to show a print copy to others in your company. It will load in a separate browser window. Polydomes work best if the background is black or very dark. Not only do dark backgrounds look more dramatic, they also have the advantage of not showing moisture as much. Although the photo-quality print media is considered waterproof, over time, moisture can seep into the edges and leave a stain. That is hidden better with a dark background. So it will look better longer if you have the option of providing your logo with a black or dark background. If you don't have a dark background option, we can probably modify your logo as part of our photo-processing service. The following images and explanations will help describe the layout options. If you are interested in getting clubs with Polydome logos, please contact us by email or call us at 1-937-985-5863 (Eastern USA).